Sandy Christies is running in the London marathon again this year after managing to get a guaranteed place by completing the Lochness marathon in 3hrs 15mins. Sandy said, "This allows me to raise money for my own chosen charity which this year is going to be Breathe Easy". "My wife's step mother, Mrs Beta Brunjes, has been an active member and fund raiser for Breathe Easy since she was diagnosed with C.O.P.D in 1999". The British Lung Foundation's Breathe Easy Club began in 1991 when its founder Trevor Clay - the first male secretary of the Royal College of Nursing and himself an emphysema patient - recognised the need for people with similar experiences to come together on a regular basis o support each other and learn more about their lung conditions. Sadly, Trevor Clay died in 1995. However, his lasting legacy to the British Lung Foundation is a successful and thriving Breathe Easy Club. On average, one person in every family has a lung condition and yet people suffering from conditions such as asthma and emphysema often feel alone. The British Lung Foundation's Breathe Easy Club is Britain's only support and information network for anyone affected by a lung condition. The club is also open to their friends, families, carers and interested health professionals. Encourage mutual support for people living with and affected by a lung condition. Raise local awareness of the BLF and Breathe Easy amongst the general public, health professionals and people with lung disease. Support the BLF research programme through fundraising. Promote the aims of the BLF through active campaigning. To support people living with lung disease. To provide public information on lung disease and good lung health. To raise funds for research into diagnosis, treatment, prevention, and cure of all diseases of the lung. Sandy said "Last year thanks to contributions from local companies, friends and colleagues I raised £2500.00 for the Bornfree foundation. 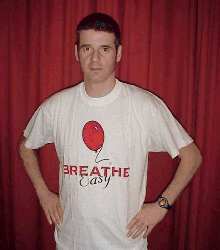 This year I hope to raise as much as possible for Breathe Easy and British Lung Foundation".
" Any help and or contribution that anyone can provide would be very much appreciated."